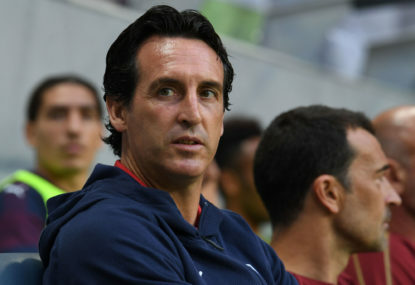 It has not been an ideal start to Unai Emery’s Arsenal career, having to play Manchester City and then Chelsea right off the bat. The Gunners travelled to Stamford Bridge last week and conceded two goals early. However, it’s still a game they should have won. Mesut Ozil, Pierre-Emerick Aubameyang and Henrikh Mkhitaryan all had atonishing misses. Mkhitaryan did find the net in the end though, as did Alex Iwobi, as 2-nil became 2-all before half time. Arsenal went on to lose the game 3-2, but Emery had plenty of positives to work with in attack, and plenty to work on in defence. The other big positive for the Gunners has been Matteo Guendouzi. The 19-year-old came straight into the squad from Ligue 2 in France, as is fast becoming the league’s breakout star. Captain Laurent Koscielny returned to training this week after a long injury lay-off, but is not expected to start. West Ham United’s rough start to the season has been met with a lot more criticism than Arsenal’s. After being smashed 4-0 by Liverpool, the Hammers hosted Bournemouth last week. Despite taking the lead via a Marko Arnautovic penalty, they went on to concede twice in six minutes and lose 2-1. Manager Manuel Pellegrini’s side is still yet to score a goal from open play. The other big story is Jack Wilshere. The former Arsenal man is expected to start against his old club, and he’s eager to show the Gunners made a mistake in allowing him to leave. Arsenal are shaky at the back but have a terrifying front line. If West Ham are to get a result, they need to hope the Gunners misfire for the second week in a row. That’s unlikely to happen. Join The Roar for live scores and a blog of the match, starting from 12am (AEST).